Has a character in a book ever inspired you to visit a place? After narrating 2 series of books written by Virginia Brown, I decided it was time to visit the 2 cities she described with such love and detail: Memphis, TN and Holly Springs, MS. Of course, my main goal for the trip was to get lots of pictures and videos to use in my future marketing efforts for both series! The Blue Suede Memphis series is set in — you guessed it — Memphis. The main character is Harley Jean Davidson, and she drives a tour bus for Memphis Tour Tyme. Drew voices all of the male parts in this series. We’ve done 3 books so far and are looking forward to recording the final book Return to Fender this summer. Drew and I started our April trip in Memphis. 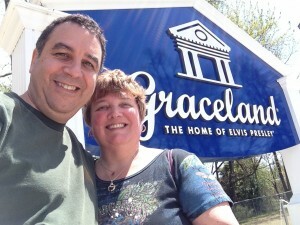 We went to several of the touristy spots mentioned in the books, with the first stop naturally being Graceland. We’ve heard for years how tacky Graceland is, so we were surprised to find out that statement is not really true. Sure, everything in it looks very 1970s, but what do you expect? Many of the rooms seemed very tastefully and expensively decorated, with crystal chandeliers and traditional furniture upholstered in velvet. For its time, the kitchen was very state-of-the-art, with double ovens and a TV. In fact, TVs were in every room. 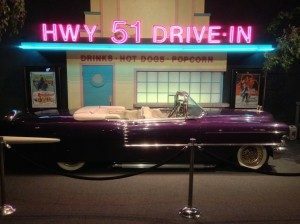 In Elvis’ lounge (think: man cave), he had three TVs on the wall so he could watch multiple stations at once. It all seemed very comfortable and homey. The pool room was covered in fabric on both the walls and the ceiling. The stairs leading up from that room to the so-called jungle room were covered in green shag carpet. I suppose that people found those elements to be tacky. Someone in front of us on the stairs commented that those materials on the walls would provide excellent soundproofing. They told us that Elvis recorded one album in his jungle room, so soundproofing would be a much-needed aspect of his house. The jungle room was called that because many of the pieces of furniture had animals carved in the wood. You also saw cow skulls like you would find on the street in the old West. The most impressive thing about the tour was the trophy room. It’s more than a room, really; it’s actually a small building. Inside this building, one side was filled with all his music awards. 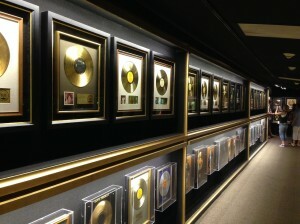 The walls were literally lined from ceiling to floor with gold records. On the other side of the building, they had posters, apparel, and other mementos of his many movies. I didn’t realize he had been in as many movies as he had! No matter what you think of Elvis or his music, you can’t argue with those many physical reminders of his unparalleled success. They also had several displays showing his many donations to charitable organizations. I was glad to see that they carried on that commitment to charity at their own cash register in the gift shop. I bought a little brass guitar Christmas ornament, and they asked if we would like to contribute to St. Jude Children’s Hospital, which we did. Two horses were in the back pasture. One was a Palomino, and I saw signage that said a Palomino was Elvis’s favorite horse. The meditation garden contained his grave, as well as those of his parents and his grandmother. Our tickets allowed us entry into his car museum, where we saw, among other vehicles, not 1 but 2 Rolls Royces, Priscilla’s 1960s Mercedes convertible, a snowmobile converted for lawn use, a couple of motorcycles, and two Cadillacs — the pink one (of course) and the one I liked, which was purple with white interior! It was interesting going on board his private plane, the Lisa Marie. I don’t think I’ve ever been in a private plane before. It looked very comfortable and housed TVs in the compartments, as well as a phone where you could call anywhere in the world. Elvis had a bedroom on board, too. We also saw an exhibit of Elvis in Vegas. They had a lot of his flashy costumes in there. We could imagine why there would be so many Elvis impersonators both in Memphis and in the book Suspicious Mimes! 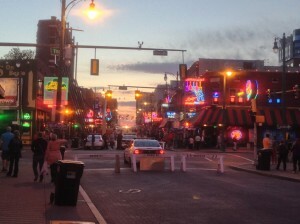 After a long but completely delightful afternoon meeting with the marketing director of the publishing company, we took the car back to the hotel and walked to Beale Street, thinking we might eat there. Every place had loud music, and smoke was everywhere. Let’s just say it’s not my kind of environment. We walked on back toward the famous Peabody Hotel and ended up in a nice conversation with a member of the Blue Suede Brigade who was standing near the hotel entrance. This group of volunteers serves as ambassadors for the city to help tourists. The brigadier suggested we dine at The Majestic, which is a converted silent theater on Main Street. People talk about the food in Memphis with good reason. The meal at The Majestic was most enjoyable, in part due to the subdued lighting, dark furniture and excellent wait staff. We had an appetizer consisting of cheese, gourmet crackers, sausage, barbecue pecans (spicy! 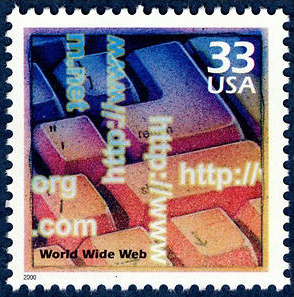 ), apple wedges and a couple of other things I’ve forgotten. For our entrees, Drew had ribs, and I had a filet. It all tasted great! 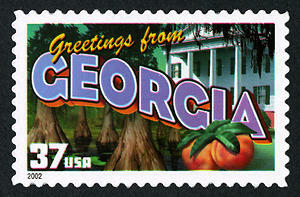 Next stop: Holly Springs, MS!